In case you didn’t know, I’ve been offering a version of my E-Design services through Project Nursery, and today I’m revealing one of my latest projects—it was such a fun one! My client didn’t want to find out the gender in advance, but did want to have options for both a boy and a girl. What I typically do in these situations is design most of the nursery as gender neutral, so things like the main nursery furniture can all be chosen in advance. My client knew she wanted to incorporate blue for a boy or girl, so I was able to choose some of the nursery decor as well that will stay no matter what the gender is. Then I chose other accents that would be specific to a boy or a girl to add in at the last minute. I created two E-Design board options so she could see how each would unfold. But first, the floor plan had to be done! She sent in her measurements and photos, and I created a custom floor plan with all the items I knew she needed in the space. This is such an important part of the process since it allows me to see the size of products that will fit, make sure things are in a safe locations, and give my customers a visual so they understand how things will work. After the nursery floor plan is approved, I move on to the fun part—designing the space! 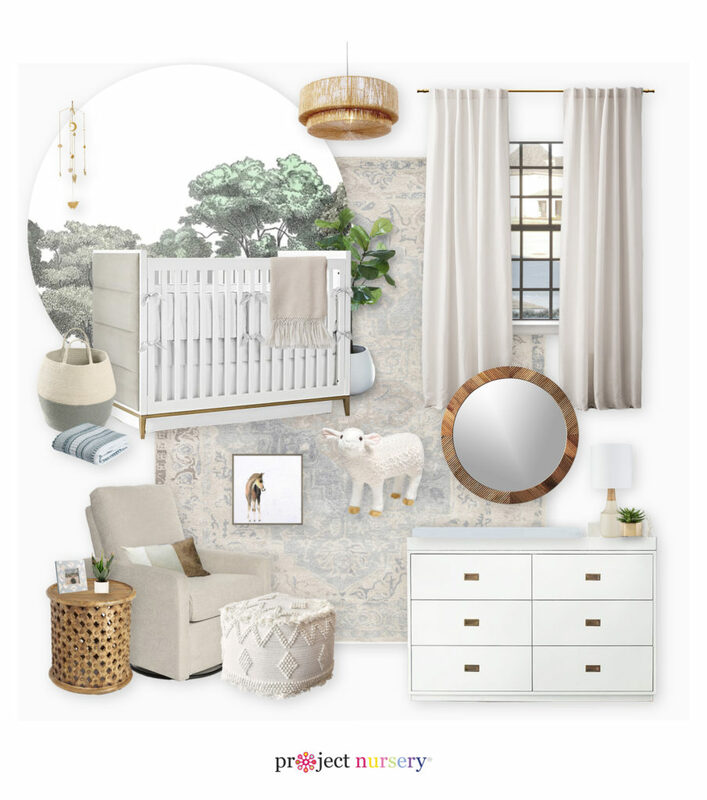 I searched for the best options based upon her questionnaire answers, budget and inspiration photos, and put together the two nursery E-Designs. The first option below would be for a boy. The main furniture items and some other decor would remain the same either way. Here’s the second option, for a girl. 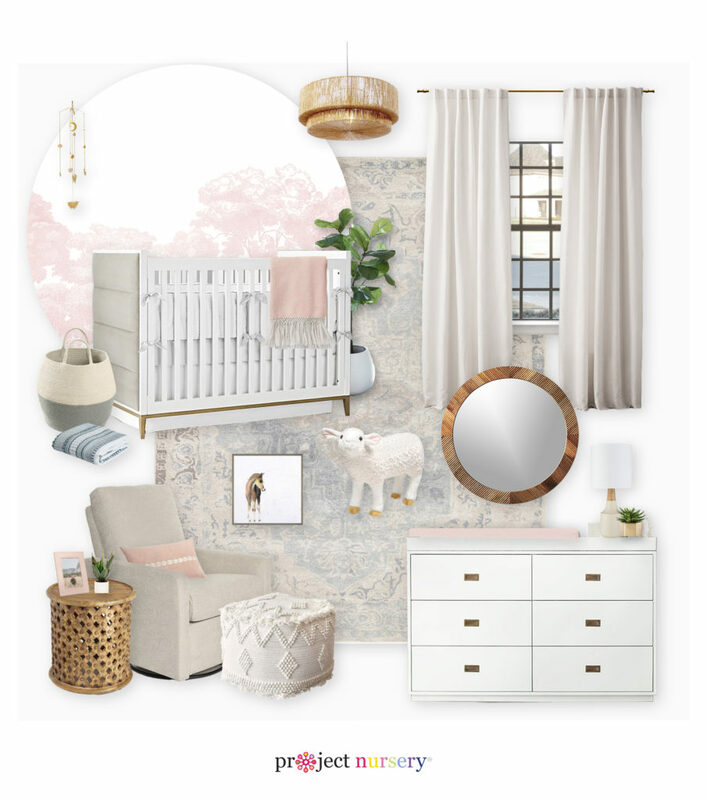 I switched out some of the blue nursery decor for pieces in blush, a color I knew she loved, and everything else would remain the same. I chose a wallpaper design that came in multiple colors, so the overall concept wouldn’t change too much. I absolutely love how this design came out! Gender neutral nurseries are more and more popular these days, and designing for a surprise is a lot of fun. Want your own nursery or kid’s room e-design? Check out Project Nursery’s Design Services! Subscribe for some amazing FREE nursery resources and lots of nursery eye-candy! (No real candy though, that's hard to send via email). Hi! Your site is great and I love your concept! – focusing on nurseries – what a great niche! 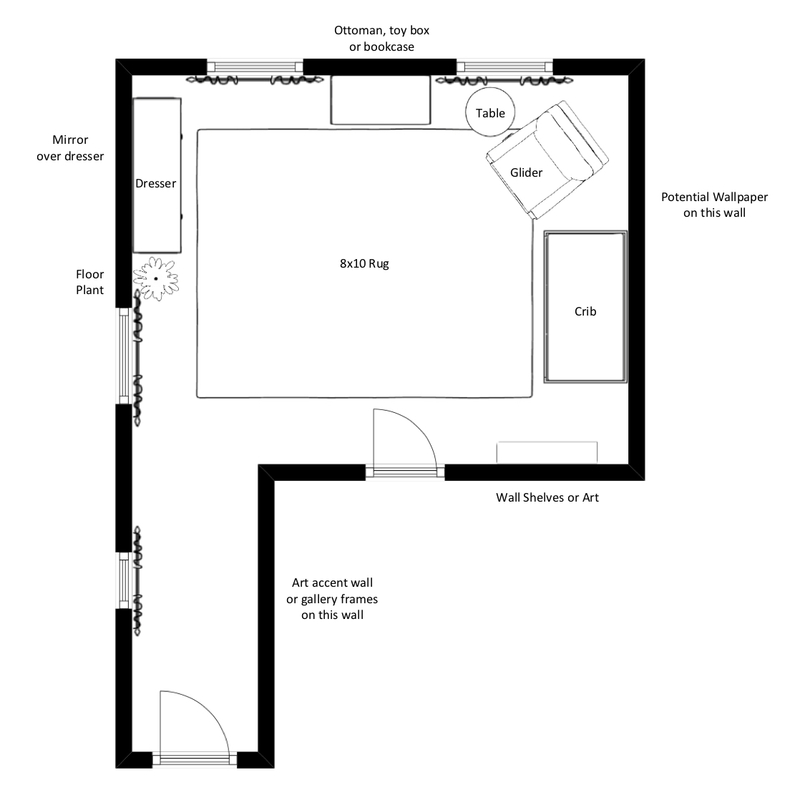 Would you mind sharing with me the software you use for making floor plans and your mood board? I’m old fashioned and just use Photoshop! & REGISTRY CHECKLISTS & MY NURSERY SAFETY GUIDE? Wallpaper an Accent Wall, or the Whole Room?